Spain and Korea celebrated the Spanish National Day in Seoul on Oct. 12, followed by another commemoration in Busan on Oct. 15. As ambassador, I addressed the attendees in Spanish, a lingua franca spoken by over 530 million people across 31 countries. The King and Queen of Spain were in Covadonga this year to commemorate the 1,300th anniversary of the victory of Visigoth leader Don Pelayo against Muslim invaders in 718. This historic event gave birth to Asturias, the first of the Christian Kingdoms to undertake the historic mission of rebuilding the old Roman Hispania. This anniversary reminds us that, like Korea, Spain is a country with a long history. This year’s celebration was my fifth in the Republic of Korea. It was my farewell event as well. Over the years, our two nations have enjoyed solid and expanding bilateral relations, aided by an increasing number of Korean tourists to Spain, which has multiplied eightfold in just the past four years. The growing tourism exchange has allowed us to get to know each other better. Koreans are attracted to Spanish friendliness and hospitality, monuments, nature and cuisine, as well as the Camino de Santiago (Way of Saint James). 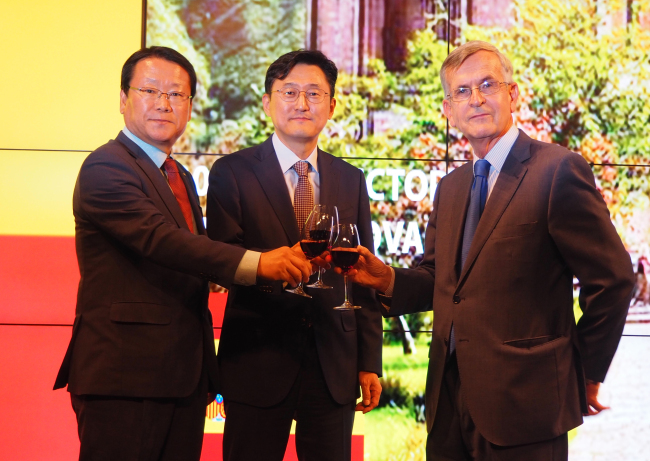 Spanish Ambassador to Korea Gonzalo Ortiz (right) poses with South Korean Deputy Minister for Political Affairs Yoon Soon-gu (center) and Honorary Consul of Spain in Busan Choi Sam-seob at a reception to celebrate the National Day of Spain in Seoul on Oct. 12. (Joel Lee/The Korea Herald). It has been a great joy for me and my family to live in Korea over the last four years, and experience the varied aspects of Korean culture. I am deeply satisfied with the numerous contacts I have developed with my Korean colleagues, including those from the government and administration, business community and civil society. In 2018, Spain’s participation in the PyeongChang Winter Olympics and Paralympics garnered four Olympic medals. My country is proud of its world-leading athletes in golf, tennis, soccer, basketball and motor racing, among others. We are a nation that values sports. Spain and Korea are allied partners in defense of freedom, democracy and human rights. We buttress multilateralism and free trade together against the rising trend of protectionism. Within the framework of our bilateral relations, the Spanish government believes there should be more Korean investment in Spain. Our country offers security, modern infrastructure, the rule of law, business-friendly policies and incentives, tax deductions and free trade of goods across the European Union. On the occasion of the visit of Spain’s Secretary of State for Commerce Xiana Margarida Mendez to Korea on Nov. 1, we will organize an Investment Forum in Seoul with the earnest intention of attracting prospective investors. I am proud of my four years of service as Spain’s envoy to Korea. During my tenure, we launched the Spanish Chamber of Commerce in Korea in 2015, which already has 60 members. The Cespedes Park in Changwon has been reopened. Korean Air and Asiana Airlines service two new direct air flights between Seoul and Barcelona. We signed a working holiday agreement that will facilitate the exchange of young people between our countries. Four Airbus tankers were sold to the Korean Air Force, and, last but not least, Spain has an excellent honorary consul in Busan, Mr. Choi Sam-seob. Spain is a modern country, the fourth-largest economy in the eurozone and 14th-largest in the world with a roughly 25,000 euros per capita income. As a member of the European Union and Ibero-American Community of Nations, Spain is a crucial soft power undergirding and connecting the European-Latin American civilizations, as it has done for centuries. Our National Day marks Spain’s discovery of the New World. At the same time, to lay the groundwork for our future, we are intensifying collaborations with Korea, particularly in the research and development of information and communication technology, sciences and biotechnology. I am optimistic that combining Korean discipline and technology with Spanish creativity and passion would harness great synergy. Spain also celebrates this year the 40th anniversary of the Constitution of 1978, a supreme law that must be defended and can be modernized, as it has bestowed our nation prosperity, decentralization, freedoms and international prestige. We face our future with hope, energy and the pride of being Spanish citizens. Spain and Korea are geographically distant, but share like-minded affinities. As Seoul embarks on a process of reconciliation with Pyongyang, Spain wholeheartedly supports Korea, taking inspiration from our shared values and desires to strengthen our friendly relationship. Together, we can create our futures with peace of mind.